Scarlett O’Hara is a name people recognize whether they’ve read the book or seen the movie. How often does that happen? She exemplifies the very description of a strong, unforgettable character. And if you don’t know, Scarlett wasn’t even likable. "Scarlett O'Hara was not beautiful, but men seldom realized it when caught by her charm as the Tarleton twins were.” I was instantly hooked. I shared it with a friend and probably read it two times in a row. 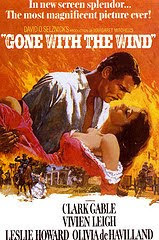 Months later, GWTW was re-released in the theatre and we saw it three times. Wikipedia says it was 1967, so perhaps I was only a toddler at the time? I can quote it (Southern dialect included) as well as my adult children quote Field of Dreams or, sadly, Anchorman. Scarlett’s draw is tenacity. She stepped over and on those around her to get what she wanted and we forgive her for it. Why? Maybe because her mother, her mammy and her Melanie all loved her and secretly, we want to be just that gutsy. Gutsy has its place, doesn’t it? Once our Katie Scarlett set her mind to something, she did it. When life handed her lemons she threw them and made sweet tea instead, know what I mean? How many opportunities have we lost because we backed down, gave up or put our goals on hold and then forgot to retrieve them? How true this is for writers! A heavily “red inked” critique, a miserable contest score, the release of a new book with the same plot and setting as your five year old manuscript, another rejection letter, a negative review. You just know what Scarlett would have said. Scarlett had no problem believing in herself and it propelled her to succeed. We all knew she’d get Rhett back, didn’t we? As a writer now, I am so impressed with Margaret Mitchell. What glorious characters! What glorious dialogue. I am just pea green with envy. We can’t separate Scarlett and Rhett from Vivien Leigh and Clark Gable anymore, but don’t think they one-upped Mrs. Mitchell’s original work. Have you let your obstacles hold you back or have you used them as stepping stones? I don’t advocate Scarlett’s methods but I do respect her gumption. I don’t want to sit out another round of the ‘Virginny Reel’, do you? If you're a writer, are your characters compelling? Is there any way you can make them unforgettable? Flawed and fascinating? Are you still excited about meeting them on the page each day? Gather up your hoops and run like Scarlett down that red clay driveway to leave a comment with your e-mail address SAFELY included. This Yankee will put your name in my carpetbag for today's giveaways--Barbour Publishing's 199 Promises of God and an all expense paid trip to Tara and all the Wilkes Barbeque you can eat. Okay. Kidding on the trip part. Oh my, what a way to kick off a Monday! Thanks, Deb, for a great blog and a wonderful trip down memory lane (yes, I DID watch the trailer, completely transfixed!). To me, when Scarlett entered a room, she was the strongest person there, and I LOVED that about her. And honestly, how many heroines can you name that have captured the world like Scarlett has and yet most people don't even like her? An amazing accomplishment by Margaret Mitchell, and one that has sealed my devotion forever. Morning, Debra (haven't decided about the good part yet :) Your post definitely helps, though. I need more of Scarlett's tenacity in my writing career today. I was just moaning yesterday about feeling discouraged and things taking so long. I'm tired of the crippled snail's pace of the writing world. So I guess I'll just pitch a fit with my lemons today, stomp off, and make some tea instead. Okaay, so I guess there are SOME good things about Miss O'Hara. And I could use some of that self-confidence and tenacity when it comes to my writing. My patience has ben wavering lately. But at least no one has trampled my fields or tried to burn down my house. So I guess I shouldn't complain! Thanks for the encouragement to keep at it. Ahah! Scarlett's biggest fan is in the house! Hey Julie. Thanks for dropping by. I'm glad you appreciated the movie trailer. Nobody does the eyebrow lift like our Scarlett. You're right about her 'owning the room'. Great insight into her character. So powerful that our attention is drawn to her whether we like her or not. I was thrilled to learn she had green eyes. My first notion that sometimes 'different is better!'. Hope you got a good rest after 'wrestling' your 26lb turkey. Yikes! over the weekend I was so tired of my own slow pace. "I feel your pain"
Two weeks to edit one chapter? So I stayed the course and once in a while it pays off. The right words. Sweet Success. We can all use a bit more tenacity, or a lot, depending on the day. I'm sort of a tortoise myself, taking it one slow step at a time. I'm glad Miss Scarlett had something to offer you today! Don't feel bad. It took me 2 hours to come up with a new hook. Honest! I'll never get tired of GWTW and I love Scarlett's determination, although I never saw what she saw in Ashley. I hope my characters are compelling or it's back to the drawing board. I've always had a little trouble with this scripture. It's not the, Don't Give Up part it's the, "after you have suffered a little while." Whew! That little while sure seems long to me in more ways than one. Okay, I'll try to be good now. You whooo! Scarlett, darling, wait up. Morning Deb and everyone, (waving to Julie), thanks for the trailer. Thoroughly enjoyed it while I'm sitting here waiting to see if workmen will show up today. It's funny that as I read your post, Julie's Charity came to mind. I didn't much like her, either. LOL But both books are fascinating studies in emotion and interaction and I'll keep going back for the thrill of the roller coast ride they give me. Margaret Mitchell was a genius with dialogue. No matter how brilliant Vivian Leigh and Clark Gable spoke the words, they needed dazzling and intense dialogue to start with. Thanks for the fun post, Deb. I needed it, and once I finish here I'm picking up my hoop skirts and running... Writing is a fall down, pick yourself up again adventure, isn't it? I needed a dose of Scarlett's gumption today! Well now about Ashley. He really couldn't hold a candle to Rhett (what an odd saying) but he was good husband material I suppose. I think she wanted him only because he was 'her Ashley' and the thought of losing him was more compelling to her than any real love. Anita Mae. Glad you enjoyed the download. 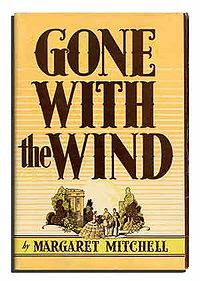 I'd like to encourage more people to read the book, so they could realize the genius of Margaret Mitchell. Susie! I can't imagine for a moment having to deal with hoops. However did they manage to get them all to 'condense' when they had to sit. I guess there wasn't a lot of reclining going on. . . they kept them on the edge of their seats! We'll all march on through the WIPs with you. Definitely a stumble and get back up again experience! Loved, loved this post. Wow, your writing is great! I can jes' see her gatherin' those hoop skirts and imagine your pea-green envy. Tell me, do you think Scarlett would cheat at games?!!! Read my blog for a good laugh. Well great balls of fire, it's Connie and Patti. I hope you got a chance to look at the movie, Connie. Oh my yes, I think Scarlett would cheat at games unless she was playing Mammy or Pa. Thanks for coming around ladies! Scarlett didn't like herself very much. In her heart, she wanted so badly to be sweet and gentle like Melanie, and I think she spent all her time kicking against the goads, so to speak, because she just wasn't made that way. Reminds me of the way we all try to stuff ourselves into the little sausage skins of whatever Christian label someone slaps on us and then wonder why we're not content! Ms O'Hara was a cheater. The writer of inkwellinspirations.blogspot.com has written a superior article. I got your point and there is nothing to argue about. It is like the following universal truth that you can not disagree with: The Matrix has you. I will be back. To some, Scarlett is not likable, but I simply adore her! She makes terrible decisions, one after another but she is a survivor. Full of gumption, she is never going to give up. At the same time, she can only take so much. Fiddle-dee dee, sometimes things are so bad you can only focus on one terrible thing at a time, and the way she addresses these times adds a charming bit of comic relief. I still wonder what Scarlett is up to these days.